Voted BOOK OF THE YEAR by Aviation Enthusiast Book Club! You'll be £10.00 closer to your next £10.00 credit when you purchase Adventures of a Cold War Fast-Jet Navigator. What's this? David Herriot served almost 40 years in the Royal Air Force as a navigator, first on the Buccaneer S2 and subsequently on the Tornado GR1. This volume recounts his early career operating the Buccaneer on three operational flying tours plus a tour as an instructor on the Operational Conversion Unit. With almost 2500 hours on an aircraft that was operated at high-speed, in all weathers and at ultra low-level, his task in the rear seat was a demanding one. But Herriot was more than just the guy in the back of a Buccaneer; he was, quite routinely, and often to the exasperation of his seniors, the life and soul of any party that was taking place either at home base or when overseas defending the flanks of NATO. This is an epic adventure for the aviation enthusiast, particularly those with affection for the Blackburn Buccaneer, and is one that provides a great deal more than the usual introduction to a specific aircraft type and the people who flew it. Here the reader will find an absolute insight into life on a fast jet squadron, at work and mischievous play during the Cold War and they will be introduced to some of the modern Royal Air Force’s greatest characters. We all enjoy a book on the operational history of an aircraft type, tech spec or a campaign or unit history. However, there's nothing to beat an autobiography, particularly if like me you've never slipped the surly bonds and experience life in the cockpit at the sharp end. 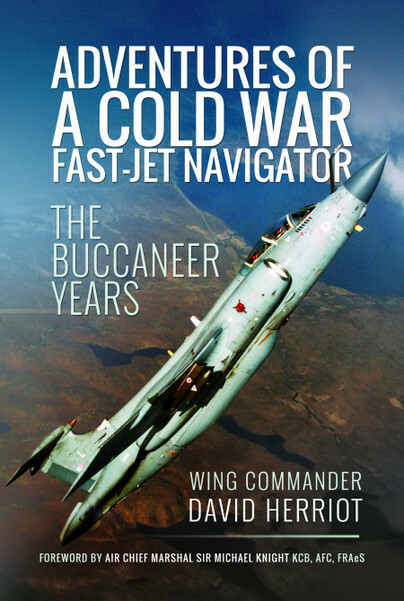 This has been a good year for cold war/fast jet memoirs as interest in this era grows. David Herriot's book is a worthy addition to the genre. The layout could have been better but it's printed on quality paper and is a solid read. This is a really fantastic read and a lot of fun and you will come away with a good appreciation of RAF training and honing the edge in the very capable Buccaneer. This is a book I’ve been eagerly awaiting since it was first announced last year. And it doesn’t disappoint. Covering two thirds (in flying hours terms) of his career as a Cold War Fast-Jet navigator, David Herriot's book does exactly 'what it says on the tin'. The body of the book, chapters seven to eleven, cover in equal measure the intertwined social and professional aspects of his life on three Buccaneer squadrons (the first and last being in RAF Germany) and the Buccaneer OCU. The author admits to being 'too much of a comedian and not taking life seriously at all' and that comes through loud and clear in those chapters. The descriptions of squadron life and of the Buccaneer, and how it was operated in its different roles, are wholly authentic although his criticisms are reserved, particularly in the later chapters, for the 'system', and for himself. But his anecdotes of social episodes, usually related to alcohol and detachments, are written in a humorous, and often self-depreciating style and some, which I hadn't heard before, had me almost weeping with laughter. The book is well produced and the extensive photographs, many previously unpublished, add considerably to it. This exhilarating tale, sub-titled The Buccaneer Years, describes twelve years of high-octane life in the back of one of the RAF’s most potent combat aircraft. Best of all, though, is the book’s dedication to a Buccaneer stalwart, sadly no longer around, acknowledged as having taught the author everything needed to know professionally: about flying, navigating, ‘weaponeering’, drinking, and having a bloody good laugh. Amen to that! Looking forward to Volume Two. If you have any kind of interest in the RAF, or those that serve then this is definitely worth a read. As a former Buccaneer Aircraft Engine Technician and having served on two Buccaneer Squadrons 208 and 16 Squadrons, I find David's book very enjoyable and an insight into the life of our Crews when playing with our charges.I served with David on 16 Sqn and the stories he relates to in the book have triggered treasured memories of a time in my youth when we played hard, worked hard, and made friendships that have lasted to this day! David's tales of his experiences as the 'Back Seater' and the flying he was involved in I found intriguing, I especially liked the story about the messing around with the Russian Navy. I was also on the Red Flag Detachment to Nellis AFB outside Las Vegas in1981 which produced some spectacular flying and legends that still continue to be told on many a military website. Given David's involvement during this detachment, he gives a good description of the tactics that were used to good effect and the legendary 'Skullduggery' employed by highly trained RAF Crews. I was very interested in his telling of the unfortunate fate of Buccaneer XT160 which unfortunately crashed on the ranges while the Squadron was on detachment at RAF Decimonnu in Sardinia, thankfully there were no fatalities. One of the photos included in the splendid selection throughout the book shows the tailplane of this aircraft bobbing around on the sea. This brought disturbing memories back to me as, due to the confusion of such times, a fellow technician and I were tasked to swim out to it and tie it to a rock! The reply was not usually given to an Officer by young fellows like us! I highly recommend the book to everybody with an interest in Military Aviation as it covers a time when an aircraft called the 'Buccaneer' aka 'The Brick' (due to it's strong build, I say Brick as it is the clean version), which the RAF initially rejected ended up as the best Low Level Bomber in the world! Flown by the best, Fixed by the best! 'They Bendum - We Mendum' Genetic term for the interactive relationship between Aircrew and Groundcrew! The RAF has always had amongst its vast contingent of aircrew a large number of colourful characters. The Cold War era of the 1970s was no exception and the Buccaneer force, for reasons which are not easy to identify, attracted more than its fair share of them. Of these, one has stepped up to the plate to tell an epic tale of life in the air and on the ground with this unique band of brothers. David Herriot's excellent biography has done just that. Laced with many humorous anecdotes from his early days in Glasgow, through navigator training to the front line in Germany and the Maritime Attack Force. His story makes good reading for those wishing to share an experience of life for a 'sack of spuds' in the back office of a Buccaneer. For those with only a passing interest in that sort of thing it promises a damn good laugh. A great read. If you enjoyed "The Buccaneer Boys" or other titles of that genre then this is the book for you. A fascinating story of one young man's journey into the back seat of the best low-level bomber of the cold war era. A very authoritative account, describing the various stages of aircrew training and life on an operational fast-jet squadron. The book is filled with many very amusing anecdotes that make you wish that we could be freed from the PC constraints of these modern times.The ethos of the day was fly hard, play harder and why not? After 24 hours in QRA,with a one-way ticket over the iron curtain, you are entitled to let your hair down. How long do we have to wait for volume 2, The Tornado Years? David Herriot served in the RAF for 38 years as a navigator and qualified weapons instructor both on the Buccaneer S2 and the Tornado GR1. Born and brought up in Glasgow, he now lives in West Bridgford, Nottinghamshire with his wife Jo. He is a keen amateur genealogist who has researched his family history back to the 17th Century in and around Edinburgh and the Scottish Borders. When not writing, he enjoys golf, the theatre, walking his Labrador and every minute spent with his five grandchildren.